Fishing trawler Sky Wind was arrested and fined for illegal crab fishing in the Russian waters near Sakhalin. The vessel was detained by the boarded guard and navy for routine check, but on board the inspectors found 1 ton of frozen crab products produced from 2.6 tons of live crab. The ship was escorted to the Russian port, where was held rapid administrative procedure for violating the rules for fishing. The shipowner of the fishing trawler was fined with 2.5 million rubles (about 40,000 USD), while the Master received smaller fine. 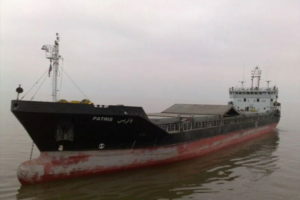 The vessel was seized for the income of the Russian state, until the fine is transfered. The crew is currently in good health conditions and has enough supplies. “According to the court, initiated by the military prosecutor of the 318th military garrison prosecutor’s office, for violating the rules and regulations governing fishing in the exclusive economic zone of the Russian Federation, the shipowner was fined 2.5 million rubles. Poaching catch (crab products) and the vessel were seized”, said the official statement. Fishing trawler Sky Wind (IMO: 8809270) has overall length of 50.00 m, moulded beam of 9.00 m and maximum draft of 3.50 m. The vessel has gross tonnage of 496 GRT and operating under the flag of Togo.